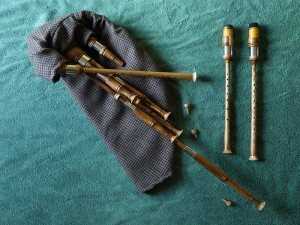 So I started researching smallpipes, joined the Lowland and Borders Pipers’ Society, was lucky enough to get one of their Richard Evans practice sets on hire straightaway and, with the enthusiastic endorsement of top piper Dougie Pincock (now a Highland music colleague of mine), went to see Ross Calderwood at Lochalsh Pipes about a set of my own. Now, Ross is a true enthusiast, interested in a wide variety of music as well as passionate about piping, and (having had ample time to hone his craft at a serious ‘hobby’ level before quite recently starting to market it more) working with native Scottish hardwoods to make some of the most attractive and best-value pipes out there. So we talked about pipes and woods for hours, with the result being a kind offer to specify two different woods for my combo set (leaving the final choice till the time of collection), and I left knowing that I’d be coming back to choose between the local laburnum that first caught my eye or the very attractive alternative of yew. 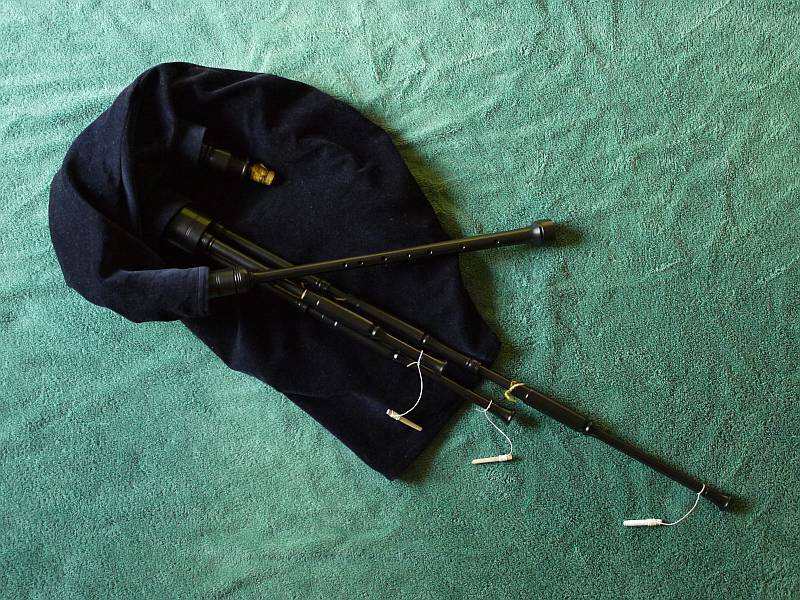 So away I went and continued to work with the Evans (single drone) set till this Ian Kinnear poly set in A (apparently perfect bar a damaged chanter reed) popped up at an irresistible price on eBay. Now, of course I didn’t need it with my new set already on order (though I’d otherwise have snapped it up at the ‘Buy It Now’ price), but sat watching as it nearly went for a silly price, threw in a half-hearted, last-second bid I judged to be too low and was amazed to actually get it. So off I went to see Ian in Edzell in July to get a new reed and the pipes checked over/set up to his satisfaction, also signing up for his September course at the Burn (which looked like just the ‘right thing at the right time’ for me). And the course (just two weekends ago now) was great, with Ian and guest tutor Duncan Nicholson full of good advice to help me past some problems both previously identified (overgripping, fighting the chanter, hunching my left shoulder) and unsuspected (left wrist position, of which more anon), not to mention the very welcome chance to meet, talk to and play with a number of other pipers of varying experience. 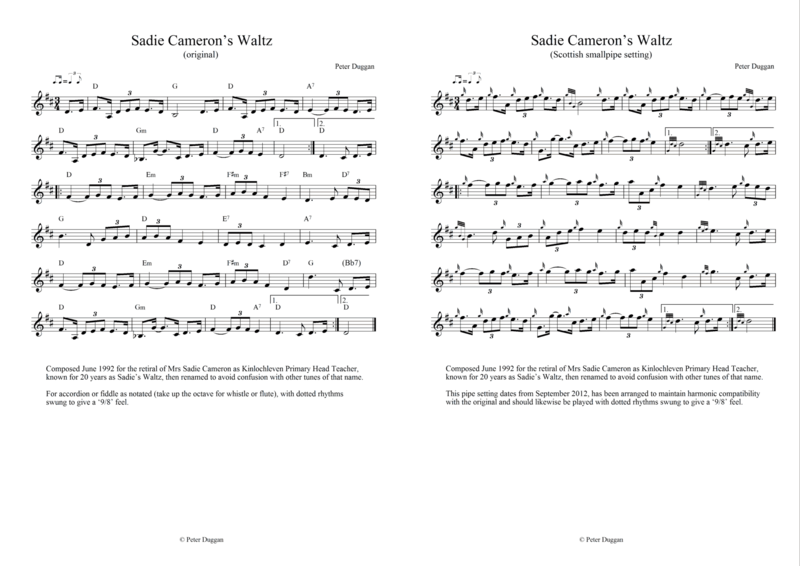 So, with Duncan also looking at my recent pipe setting of one of my own tunes (Sadie Cameron’s Waltz, for which you can find both whistle/flute audio demo and original/pipe notation here), making a few suggestions to tidy up the gracing and giving me a quick extra tutorial on the great G.S. McLennan’s Kilworth Hills, my head was absolutely buzzing by the time I got home! Now, while I’d hoped at one time that Ross might have my new pipes ready for Ian’s course, it’s probably just as well that I was spared the added distraction of a last-minute collection of an untried set I couldn’t yet manage and had to wait a further week to pick them up. So I chose the laburnum set after all (though I’d honestly have been delighted with either!) 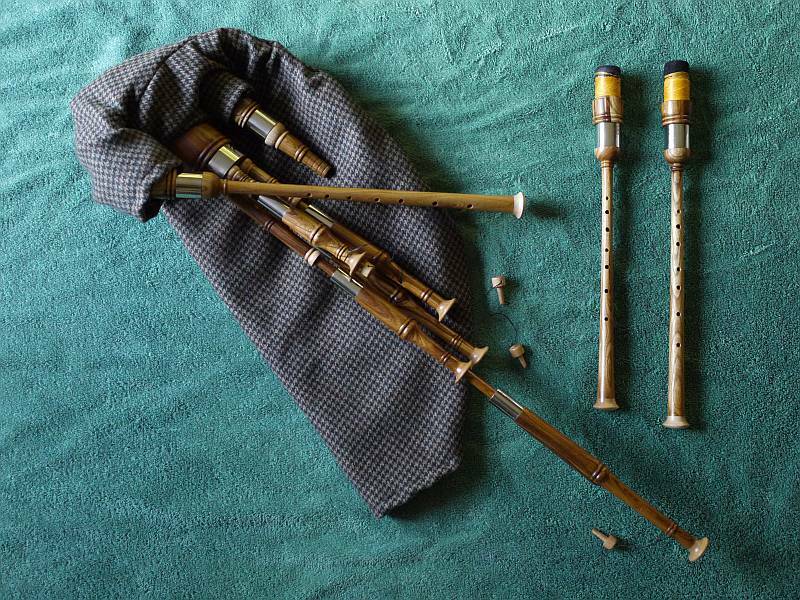 and now just have to get used to their unexpectedly different pressure requirement (lower than I’ve been playing recently despite sharing some key design characteristics with Ian’s pipes). To which I must add that, while I had liked the higher pressure Ian set up for me in keeping my beginner blowing steady, I just love the sound of Ross’s pipes and, with some judicious tweaking at his house followed by three days of pretty solid practice at mine, am starting to regain that level of control without the associated physical effort (possibly yet another factor in previous tension issues) and think I’ll now have to take back the pressure of Ian’s pipes a bit to keep both sets ‘compatible’.